A robot created by Washington State University scientists could help elderly people with dementia and other limitations live independently in their own homes. The Robot Activity Support System, or RAS, uses sensors embedded in a WSU smart home to determine where its residents are, what they are doing and when they need assistance with daily activities. It navigates through rooms and around obstacles to find people on its own, provides video instructions on how to do simple tasks and can even lead its owner to objects like their medication or a snack in the kitchen. “RAS combines the convenience of a mobile robot with the activity detection technology of a WSU smart home to provide assistance in the moment, as the need for help is detected,” said Bryan Minor, a postdoctoral researcher in the WSU School of Electrical Engineering and Computer Science. Minor works in the lab of Diane Cook, Regents professor of electrical engineering and computer science and director of the WSU Center for Advanced Studies in Adaptive Systems. For the last decade, Cook and Maureen Schmitter‑Edgecombe, a WSU professor of psychology, have led CASAS researchers in the development of smart home technologies that could enable elderly adults with memory problems and other impairments to live independently. Currently, an estimated 50 percent of adults over the age of 85 need assistance with every day activities such as preparing meals and taking medication and the annual cost for this assistance in the US is nearly $2 trillion. With the number of adults over 85 expected to triple by 2050, Cook and Schmitter‑Edgecombe hope that technologies like RAS and the WSU smart home will alleviate some of the financial strain on the healthcare system by making it easier for older adults to live alone. RAS is the first robot CASAS researchers have tried to incorporate into their smart home environment. They recently published a study in the journal Cognitive Systems Research that demonstrates how RAS could make life easier for older adults struggling to live independently. CASAS researchers recruited 26 undergraduate and graduate students to complete three activities in a smart home with RAS as an assistant. The activities were getting ready to walk the dog, taking medication with food and water and watering household plants. When the smart home sensors detected a human failed to initiate or was struggling with one of the tasks, RAS received a message to help. The robot then used its mapping and navigation camera, sensors and software to find the person and offer assistance. The person could then indicate through a tablet interface that they wanted to see a video of the next step in the activity they were performing, a video of the entire activity or they could ask the robot to lead them to objects needed to complete the activity like the dog’s leash or a granola bar from the kitchen. Afterwards the study participants were asked to rate the robot’s performance. Most of the participants rated RAS’ performance favorably and found the robot’s tablet interface to be easy to use. They also reported the next step video as being the most useful of the prompts. 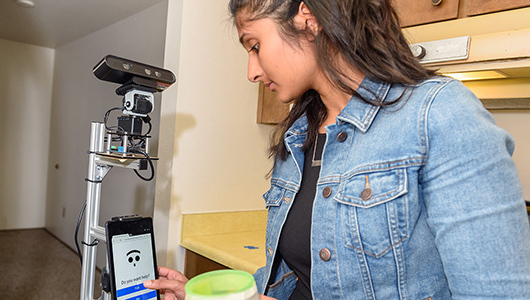 Top photo: WSU master’s student Nisha Raghunath demonstrates the interactions between a human and a helper robot at the WSU Smart Apartment in Pullman. The robot senses when the subject makes a mistake in daily tasks and offers assistance to help the person accomplish their tasks.